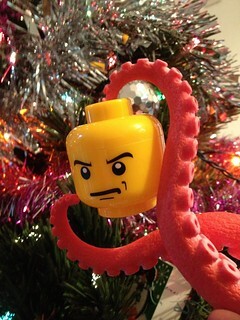 On Saturday morning, I put up my Christmas tree, and it is now adorned with its usual Edward Scissorhands at the top of the tree, tentacles poking out from the branches, Lego head dangling, and some baubles, tinsel and lights. Today I bought a circuit board star to hang from it and on Friday, I hope to make a sputnik bauble for it at Dorkbot. On Sunday, at the Big Bang Data exhibition at Somerset House, I watched a video of inside a data centre; saw static made up from numbers; saw pictures of data centres from around the world; saw submarine telegraph cables through the ages; learnt about the network infrastructure around Somerset House and in New York; found out about where people's cats live; and stared at faces constructed from DNA taken from chewing gum and cigarette butts. I purchased the Ladybird Book of The Hipster, as it amused me, and I now want to do the things mentioned in it, like visiting a "pop up trifle bistro in an old spitfire" and wearing "hats made of forklift tyres and coloured balls." "There's the Spinnaker Tower," a girl pointed out, while walking over Waterloo Bridge, and I was worried then that I had ended up in Portsmouth by mistake. I rode a horse on the carousel in the Christmas market and it was then that I felt delighted with the world. I ate some apple strudel and then wandered inside the Tate Modern and stared at the Empty Lot, which is no longer empty, as plants have started to grow. It consists of wooden planters filled with soil taken from different parks and other such places in London, which they water and shine light on, and just see what happens. Haven't been on LJ in a while and am catching up. I always love reading your posts. Your way of describing things really makes me wish I was there with you!